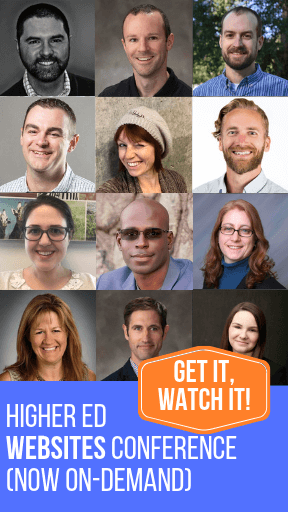 UPDATED: Has Facebook “Stolen” your FB official #highered page? 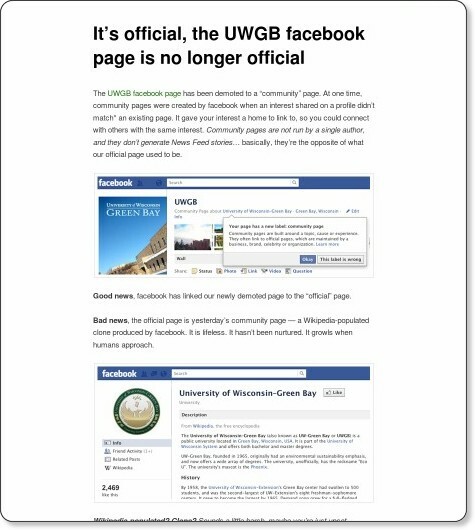 UPDATED on Jan 27, UWGB and other institutions got their official pages back, for details, check the bottom of this post. 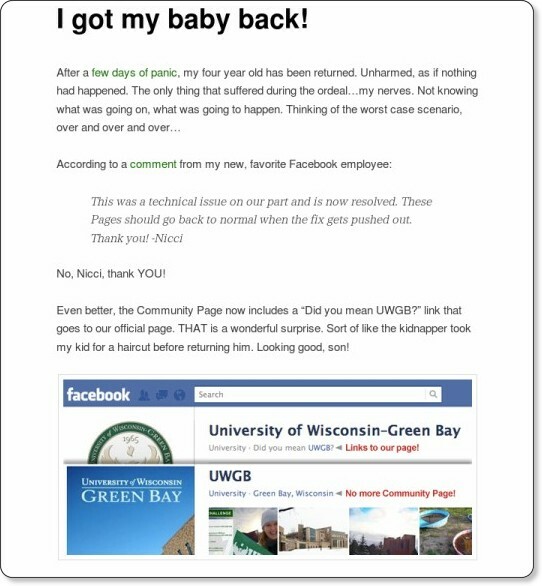 After reading Todd Sanders’ blog post on how the official UWGB Facebook page was hijacked by Facebook (basically by switching the institutional page with the “community-generated” FB page), I asked Wednesday morning on Twitter and Facebook if anybody else in higher education had noticed any change. And, it looks like a few other institutions are in the same boat including Ithaca College, Monroe CC, Radford University, etc. Check yours and let us know if your official FB page has also been “stolen” by posting a comment below. UPDATE: According to a comment posted by Brad J. Ward, this might be a change in progress at Facebook. We have had the same problem at Colorado State University for months. Facebook continues to not respond. We have also tried to get people to report the page, but it doesn’t seem to do any good. Yep, facebook.com/lebanonvalleycollege has been hijacked. It also amended our hours – which are completely made up and inaccurate. And also, not editable. Solution: http://www.flickr.com/photos/bradjward/6760465617/ might not show if you’re an admin, pass it around and let others vouch for you. @Bradjward, we have tried that for several months with people reporting the site, and have not had any success. If it works for anyone else, I would be interested to find out how long it took. The biggest issue we’re dealing with is that the community page (aka our real official page) is not showing up in Facebook search the way it did previously. Additionally, on Google it now ranks below the University (aka Wikipedia) page. Aggravating. @BradJWard we noticed that last night. Who knows if it will work or not though. From what I can tell, page functionality has not changed. It’s just annoying that’s all. It happened to us at Wisconsin Lutheran College last night (facebook.com/wisconsinlutheran). I’m so frustrated right now. Bradjward – thanks for the clarification. I was nervous, at first, that our fan page here at Saint Michael’s College was no longer going to be publishing to our fans’ news feeds, which would be a pretty big blow. But, as you correctly point out, fan pages still work largely the same as they did. They’re just now categorized differently (in some cases more accurately because they link to the “official” college page, where they didn’t before). That’s not to ignore, either, the fact that Facebook still generally does not respond to issues that substantially affect semi-prominent users. That continues to be a tough pill to swallow. Feel badly for Chris and Emily. We couldn’t upload images to our fan page for the better part of two months, got no assistance, and then the problem magically went away. Alma College: http://www.facebook.com/almacollege Our hours were hijacked quite a while ago as well. Can’t edit them. While searching for Alma and the other colleges mentioned, I noticed none of them show up under Pages anymore — just Places. This frustrates me, as I worry that people won’t be able to find our page while searching on Facebook. Syracuse University remains as a University page (for the time being). We’re watching it. If they are changing how Community pages work, they’ve yet to update their “help” material. If you can find the “Fix this” button/link they speak of, please let me know. I can’t find it, and I’ve been looking. The solution you provide was brought up by Lougan late last night, and was promptly added to the blog post as an update. Maybe you read it earlier in the evening when it wasn’t listed. Or maybe my post was too wordy and didn’t engage you. As for the “Facebook colleague” who shared info with you, that is exactly what I claimed to be the problem in my blog post. You have a connection you can contact, while I do not. To me, THAT is the bigger issue. I am curious to know if anyone who had their page hijacked into a community page had listed their page as the “official” page of others. For example, we listed Webster University (non-community page, maintained by our office) as the official page for our Athletics page under its information tab. Our extended campuses also refer to our page as their official page. I’m curious to know if by directing other pages to our official page we may have stopped the hijack from happening. Make sense? Our pages have been converted to Community-Created Pages. It’s different than the Community Pages (or Wiki Pages as I call them). Another scary thing I just noticed, if your page is a Place, non-admins can change the info for the page. (not just non-admins, but people who don’t even like the page) At the very least, they can suggest a change. Admins don’t get notifications when this happens. The only way to fix it is to turn off your page as a “Place” by going into settings and unchecking show “Map”. But the problem with that is fans can’t check in anymore. This is really getting stupid. We have two Facebook pages (long story) and both have been listed as Community Pages of Facebook’s “official” page for us for months. If you are on the Edit Profile Page and try to Delete the Facebook’s “official” page and Save changes, it just pops right back up. And if you try to search for your page in that field, nothing happens; it only searches their “official” pages. In a search for us in the Facebook search area, their site appears as the first item in All Results and Pages. Our sites only come up under Places. Further searches of the various names our campus goes by: CSUDH, Cal State Dominguez Hills, etc. all have “official” Facebook pages, with the same wiki entry. Hobart and William Smith Colleges has been demoted to a community page (http://www.facebook.com/hwscolleges). http://facebook.com/NebraskaWesleyan has been demoted to a community page as well. I published a story to our wall and it did not publish to news feeds. Not cool! Good grief, just looked at our site after reading a highereds post and Pacific Lutheran University is now a community page too. https://facebook.com/Pacific.Lutheran.University. Well that’s disappointing. And w/o warning too. Esp. when nearby colleges, Seattle U., UPS, U of W, all have the “university” designation still. When I googled our facebook site, it still came up above the wikipedia site, but still. Very frustrated. I saw the “Fix This” link on your UWGB page (and went through the steps to click and report), but it didn’t appear on the similarly-downgraded Ithaca College page. Its availability must depend on some individual characteristic(s) of individual FB users. “Is this wrong?” shows on Ithaca for me, just marked it as ‘official’. Our Virginia Tech page is still a page (facebook.com/virginiatech) but we’re watching it closely. In talking to the other page admins, it sounds like Facebook had announced or tried to communicate its effort to switch to community pages a few months ago. I can’t remember what we did or didn’t do in response, but I’m wondering if that had an impact for some folks. The bigger issue, I think, is Facebook’s response or lack of it. We’ve had little luck before trying to get any kind of clarity or help, especially when trying to remove pages that have been outright offensive and false. Google’s the same way. Anyone try to fix their Google place page, even after they’ve claimed ownership? It’s downright infuriating. There’s got to be a way to get some sort of traction. Maybe working collectively, we can. Of course, I’d probably have more success digging a hole and ending up in Nepal, but it’s worth trying. Erik at Cal Lutheran, I went to your page and merrily clicked on the (is this wrong?) prompt, but because I’m an admin on mine, I can’t see PLU’s prompt, apparently. Thanks Facebook. In the hours after the switch, I noticed that the Wikipedia faux page is now right beneath PLU’s link on the Google and Bing searches. So the impact is fairly immediate. I had my friends do a search and sometimes the official FB page didn’t turn up on the first page at all. So this is a fairly big deal. I’ve asked all my friends, who can see the prompt, go to PLU and click on the “is this wrong” prompt, but alas, I don’t know if it will do any good. “Peggy” might be at the other end. Our Class of 2016 page has been rebranded as a community this morning. A couple weeks ago, Facebook wrongly revoked admin rights to our College of Business page, but they’ve been returned after much complaining and over a week’s time. It has happened to both Cornell Law School and our Legal Information Institute, as well. Very frustrating indeed! I was notified this morning that our official Savannah State University page is now a community page linked to an defunct, unofficial page already on the site. I’ve sent Facebook a bug report and a formal request asking that the status of our page be reviewed. It doesn’t appear that any of the normal page functionality has been altered, but it’s difficult to build a proper Facebook presence when unexplained changes like this cause great confusion. South Arkansas Community College was switched over earlier this week. Incredibly annoying. Those pages that siphon Wikipedia info need to die–I don’t know where they came from or why they are there, but they add nothing. The Florida State University page has had the same thing happen to it (http://www.facebook.com/floridastate). I do not see a “fix this” option, and I am having the same problem as Amy Bently-Smith–I can’t delete the “Official Page” link. I emailed Facebook support last week about this, actually, and have yet to receive a response. The biggest issue is that we no longer show up in search results–it’s ridiculous! I can’t believe this. My page at PLU just switched back. Dare I hope all my griping (and those of all the other PLU fans) did some good? I asked them to all hit the “is this wrong” prompt. Was there really someone on the other end listening? I submitted the above links yesterday, keep an eye on them and shoot me a note if nothing happens within a week. After months of reporting, nothing happens from facebook. Three days after commenting on this post, https://www.facebook.com/coloradostateuniversity is back to being listed as a university! Not a coincidence. Thanks! MassArt is back (https://www.facebook.com/MassArtBoston). However, the search problems persist. We’re only appearing under Places, not Pages. I guess we just have to take it one step at a time. Cornell Law School and the Legal Information Institute pages are fixed, as well. It might be beneficial for us all to make a little noise on this customer service forum to ensure that we get a dedicated customer service manager for Higher Ed pages whom we can contact directly moving forward. Both Cornell Law School and Legal Information Institute are fixed for us, as well. We did start making some noise with media, so that could have helped draw attention to the issue. All of these public complaints could have been avoided if Facebook had a Higher Education manager whom we could contact about such issues. We’re all page managers for institutions, power users, and communications professionals, so one would think there would be a customer service option for us that gives us a direct link to communicate with someone at Facebook beyond this forum. One would also think the company would be amping up their customer service options for organizations and businesses prior to their IPO. Our official page https://www.facebook.com/STLCC.FP is still listed as a community page and I have had no success in getting straightened out. I wanted to add one observation that may or may not be relevant. We have several official pages. only one has a number of competing pages that are mostly auto-generated by Facebook when someone claims a slightly different name for where they went to school. This is the only page that was demoted from official (and yes, Patrick Powers, it was listed as official). The others seems to be sailing along smoothly. I have had no luck in trying to get the official page recognized as it does not show up in the list of options when I try to select the right one. I will try to be a patient and see how things work themselves out. Many folks who manage higher ed pages who have posted on the Facebook Help forum are saying that their pages are now fixed. That may be where Facebook is monitoring the situation. The University of Tulsa’s facebook page has been returned to official status as of sometime last night. Hobart and William Smith has also been returned to “normal.” Thank you so much! Thanks to everyone who’s posted about this here and elsewhere. I still can not edit the hours of operation that are now a total mess since this all happened…any suggestions?